Violent crime – including gun crime – is a problem in the US. Of course, it’s a lot less of a problem than it was in 1993, when the violent crime and murder rate was almost double what it is today. I wonder why politicians are not taking credit? Still, tragedies in schools, on the street or at work should never happen. Nobody wants that. That is not a “goal” for anyone or any special interest group. It’s a ridiculous suggestion. Have an issue with the law-abiding being able to purchase firearms and carry them for self-defense? I’d like you to consider just one of thousands of incidents – every year – where someone with a gun stopped a violent crime, sometimes without firing a shot. On Monday night, a 65-year-old woman from New Hampshire, 4-11 and 105 pounds, was stalked and followed home by a 5-11, 200 pound criminal. As she tried to get into her home, he cut her off and tried to grab her. In fear for her life, she shot him, stopping the attack. She got into her house and called 911. The criminal’s partner-in-crime (a female) scooped him up and took him to the hospital where he was treated, and charged with felony robbery. Soul-searching time: Would you deny this woman the right to use a firearm for self-defense? She could have been raped, kidnapped or murdered. We don’t have a crystal ball, and neither did this woman on Monday night. Maybe he “just” wanted to knock her out and take her wallet. We’ll never know, but would you be OK changing the laws of this country to limit her self-defense options? Would you be OK restricting her freedom to choose the self-defense option that best suites her needs? That’s what additional gun-control legislation does. It limits the options law-abiding folk have. No, the NRA does not want the mentally ill who are a danger to themselves/others or criminals to have “easy” access to guns. As mentioned before … that’s ridiculous. Let’s not use straw-man arguments in our debates, it’s a waste of time. My guess is you will not hear any stories like this – and there are a lot – at President Obama’s town hall meeting on CNN tomorrow night. “Something in my head said to take the gun out of my purse,” the woman told News 9. With her hand on the gun now in her coat pocket, she told News 9 that she headed toward her apartment. She said she looked behind and saw a man following her. The woman told police that a white man wearing a dark, hooded sweatshirt ran past her and blocked her path. “Ten feet from the front stairs. That’s when he caught up to me, and he came around me and stood right in front of me. Right in my face,” she said. The woman told News 9 that the man yelled at her. She said he reached out and tried to grab her, but she pulled her handgun from her pocket and shot him once in the chest at close range. 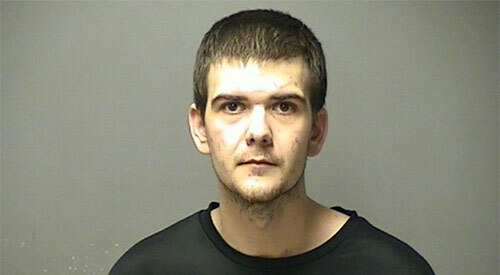 The video at the WMUR website as well as the story at the New Hampshire Union Leader identify this criminal as 23-year-old Michael Bontaites, and the partner-in-crime being one Zachary Boyd, a 30-year-old career criminal who has now been charged with being a felon in possession of a deadly weapon for having a knife. Less than three months ago, Bontaites was charged with criminal threatening. Then there is Boyd, who was charged with felony drug possession just two months ago, with additional charges going back 10 years. Zachary Boyd, 30, of 326 Amherst St., told Judge William Barry: “I’ll lose everything I own.” He also told Barry he hasn’t been in trouble for a while. Boyd was charged with felony drug possession, heroin, and misdemeanor possession of a controlled drug, marijuana, after he was found unconscious in his vehicle earlier Thursday, with the vehicle in drive. Police prosecutor Carrissa Pelletier said Boyd is subject to a 72-hour probation/parole hold. She said his record dates back to 2005 and includes burglary and a 2012 conviction in Hillsborough County Superior Court South for robbery. There’s more… Boyd was shot during a home invasion in 2006 when two men forced their way in to his apartment to steal drugs. Boyd looked to be a big-time dealer. A Manchester man who was shot in the back by an intruder this month now is suspected on drug charges. The police say that when they searched Zachary Boyd’s apartment as part of the shooting investigation, they found a large amount of drugs. Boyd, 21, was released from the hospital, and the police said they don’t know where he is. They also are looking for two men who forced their way into the apartment Oct. 3 and shot Boyd. Did you think having the FBI as the first step in identifying a potential problem can be considered “overloading the system”? Rule #? It makes common sense to contact local cops if you ate fearful someone is in danger. Gabby would not have been shot nor the 9 year old killed if the school psych counselor could have asked for a wellness check.